Flag Football is growing in popularity. The reason? It’s a great way to introduce new players to the sport of football. And it’s perfect for kids who want a non-contact alternative to tackle football programs. 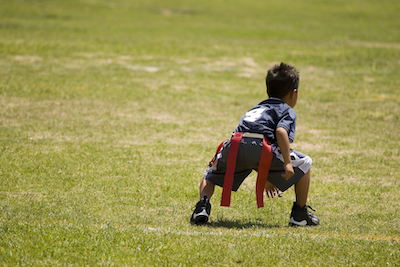 Many parents find themselves asking: When does flag football season start? If you’re searching for a flag football league — or want to start one — you’ll need to know a few basics about the sport. Here are answers to some common questions volunteers and parents ask about flag football. When Does Flag Football Season Start? 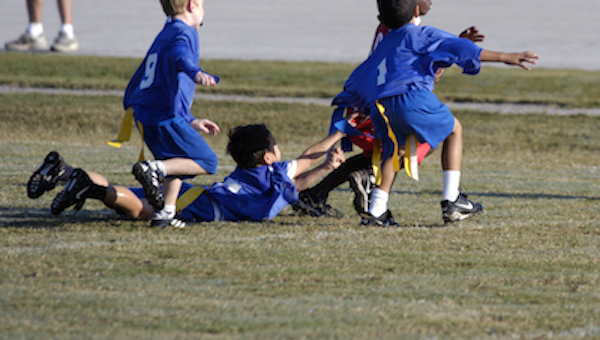 It’s easy to assume that flag football is a fall sport–like tackle football. And many youth football leagues have a flag program that runs in parallel with a tackle program. But you’ll find flag football programs available year round. In fact, the NFL sponsors a year-round flag football program for youth called NFL FLAG. That program caters to both boys and girls between the ages of five and 17 in over 1,000 leagues. Other national organizations with flag football programs include Pop Warner and i9 sports. You’ll also often find flag football at YMCAs or at churches, through Upward Sports. Some of these organizations offer regional and national tournaments. Also, check local recreation centers and indoor sports facilities for flag football leagues. You’ll often find flag football play moves indoors during colder months. In every area, the local league drives the timing of the seasons. You can expect seasons to last 6-12 weeks. They can include pre-season, several weekly games, and playoffs. Starting a new flag football league can help get younger participants involved with your organization. If you can’t find an existing league with seasons that suit your needs, why not start one? National organizations have programs to help leagues get started with minimal time and investment. If you’re thinking about starting a new flag organization or adding flag to your existing tackle program, check out our blog post How to Start a Flag Football League. What Are the Rules of Flag Football? Most leagues allow the offense four downs before a turnover. In some cases, flag teams follow the approach of tackle teams. That means they have four downs to advance the ball 10 yards. However, in other leagues, the offense has four downs to cross midfield. Then they have four more downs to score. This modified approach can work well for smaller fields or younger players. Often, leagues have four quarters of play–just like tackle football. Ten minutes per quarter is common, with a ten-minute halftime break. What is the Size of a Flag Football Field? Flag football fields are generally smaller than their tackle football counterparts. But the good news is that you can use a section of an existing tackle football field for flag games. Field sizes range from 50 to 80 yards long. If your league partners with a national organization, you may have to follow its field size rules. For example, NFL FLAG fields are 70 yards long and 30 yards wide. The play area is 50 yards, with end zones taking the remaining 10 yards. By contrast, i9 recommends fields that are 50 yards long and 30 yards wide, with 30 yards of play area. The organization also notes that leagues can change the field size to suit the space available. What Kind of Equipment Do You Need for Flag Football? One of the benefits of flag football is that players don’t need a lot of equipment. Typically, players wear a nylon belt with a flag. No helmets or pads required. You’ll also need footballs and team jerseys–but that is it! The cost for these items is low–so your league doesn’t need to spend much to outfit players. In fact, NFL FLAG estimates equipment costs of less than $25 per player. This minimal equipment cost can help you keep registration fees low and attract more players. Of course, families will need to budget for personal gear for each player. Cleats are a must–and protective items like mouth guards are a good idea. Parents may also choose to buy extras like compression shorts, receiver gloves, protective armbands, and water bottles. Even with these add-ons, flag football can be an affordable sport for many players. Football season always generates a lot of excitement. You can extend that enthusiasm year-round by participating in a flag football league. If you’re new to the sport of flag football, you’re certain to have lots of questions. “When does flag football season start?” is often a first thing parents wonder–but there’s much more to learn. Flag football has many things in common with traditional football. The ultimate goal is to advance the ball down the field and score touchdowns. But there are many differences–from the size of the fields to the lengths of the quarters. Flag programs offer an affordable, safe way to learn football fundamentals. You can get started by searching for a local flag football league. Or explore the idea of starting your own. Either way, you will be taking part in one of the most popular sports around! At Jersey Watch, we help youth football programs set up websites, register players, collect payments, and manage schedules.